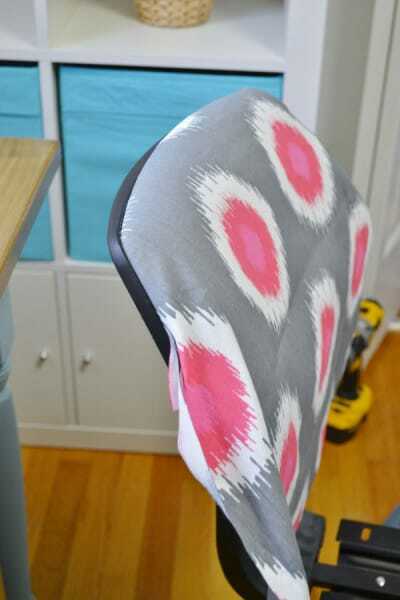 I recently shared my craft room makeover with you all, and one of my favorite parts of the space is my updated office chair in shades of pink, gray and white. I don’t know why, but I’ve been drawn to pink more lately, and I’ve especially been drawn to it in this space, that is all my own and can be as girly and fun as I’d like. 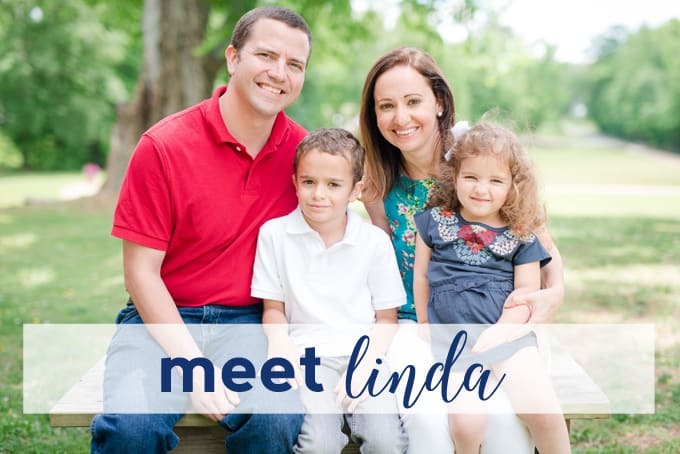 Step 1: I used about a yard of home décor weight fabric for this makeover. 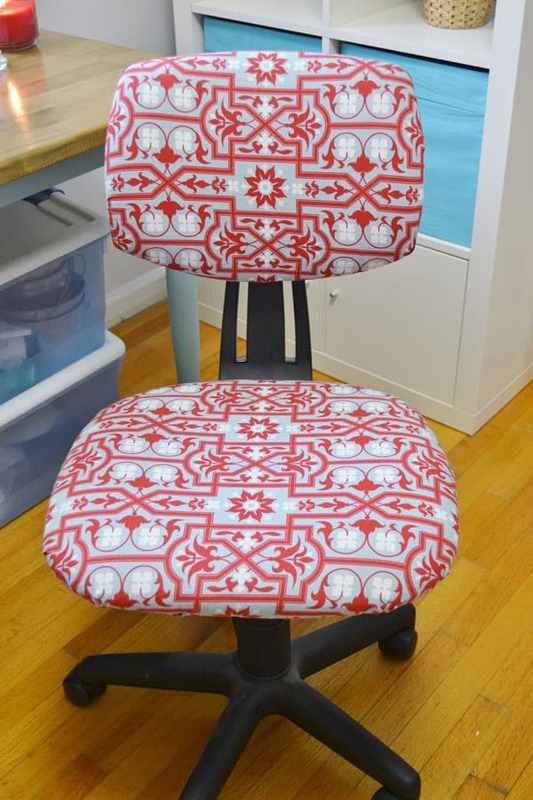 I began by taking the original fabric off the top part of the chair (the frame just pops off, so I didn’t hot glue it or anything last time and it held just fine), and cut out a piece of fabric the same size to recover with. Step 2: Unsnap the top of the chair, take your fabric and tuck it into the back of the chair. 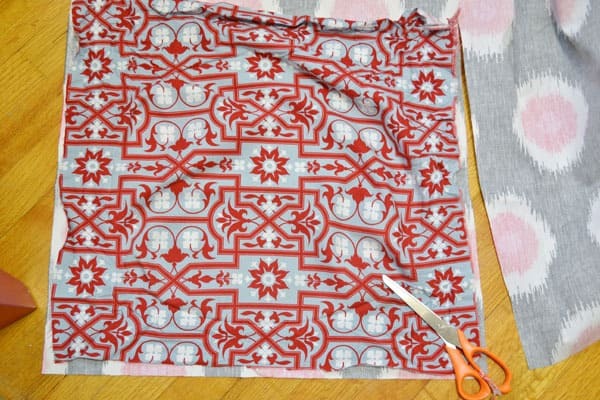 You’ll probably need a dowel or popsicle stick to stretch and pull the fabric taut. Once taut, the chair easily snaps back together again. Step 3: And now it’s time to tackle the seat of the chair. 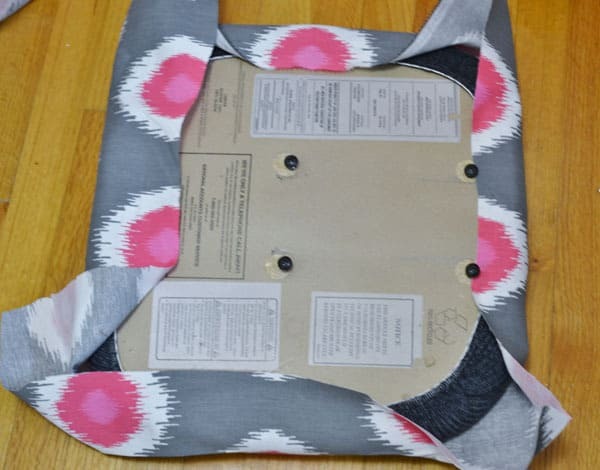 I just laid the seat (it unscrews from the chair frame), facedown, on top of my fabric, cut out a square of fabric a bit bigger than I thought I’d need, and began by hot gluing the four edges down on top of the cardboard backing. Next, it’s time to fold the corners (similar to how you wrap a gift), and hot glue down. Rescrew the seat back down, and you’re done! Here’s the chair in all it’s glory…isn’t she lovely? Thanks for reading about my office chair update! Have a great day! Oh this is beautiful!! Love it! 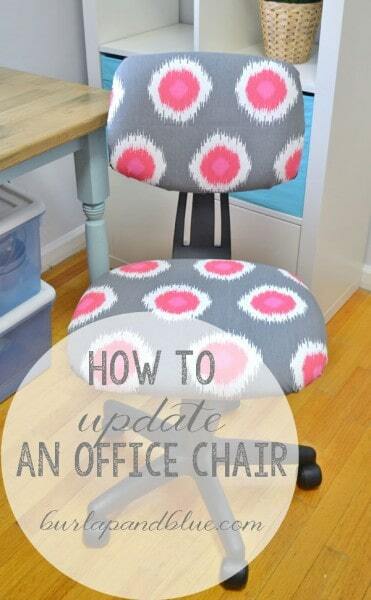 Your office chair turned out great! Love the fabric. Great Idea and it turned out so cute!